Fall is a great time to build new flower beds – you can plant perennials and let them get settled in. Closer to winter they will die back, only to reappear in the spring. They will grow and bloom in the spring, summer or fall, depending on the kind of perennial you choose. You can build a flower bed for the sun or one for the shade. Here’s how we created a beautiful flower bed for the shade! And it’s low maintenance! I wanted a flower bed by our entry stairs. This is the view visitors get when they are coming down our driveway to our house. So I made a flower bed for the shade, using the prettiest plants I could find! Since this area gets almost no sun, I had to plant very shade tolerant plants here that could withstand Zone 3 weather. I wanted it to be all perennial plants, so that I wouldn’t have to do a lot to maintain the bed once it got settled in and growing. 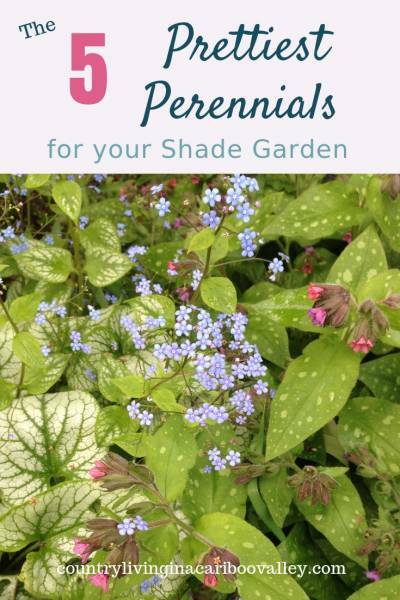 Here are the perennials I chose. Now, a couple of years later, I am doing zero maintenance and this bed always looks quite nice. I planted quite a few plants in this space and although not every one of them took, enough did that now the space is full. This bed gets a lot of snow on top of it in the winter time, as the snow slides off the roof and lands right here. We can easily have four feet of snow on top of this bed. So, shrubs were not an option for me – every time the snow fell off the roof, I could lose branches or even the whole shrub could get hit. I needed plants that would fully die back in late Fall and then reappear in the early Spring with their new growth. 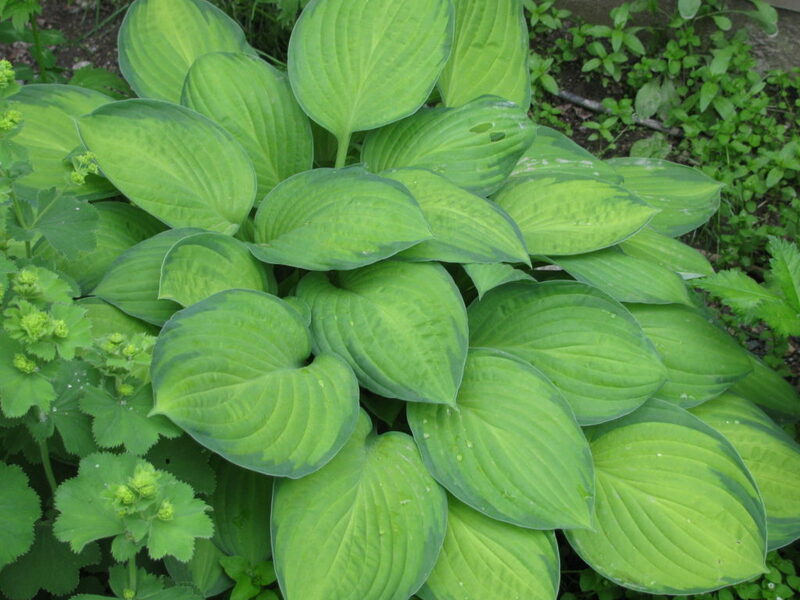 Hostas – There are a lot of different varieties of Hostas and some people have whole gardens filled only with Hostas. A sea of Hostas in a curving bed around the edge of a shady yard looks incredibly beautiful. There a also lots of different colours of Hostas, from two tone greens, to dark greens to light greens. I’m partial to the deeper green ones, and this two tone Hosta is probably as light as I will go. Hostas do come in more of a yellow colour. The flowers on a Hosta don’t really amount too much, but they are pretty and I am growing this for the foliage, not the flowers. 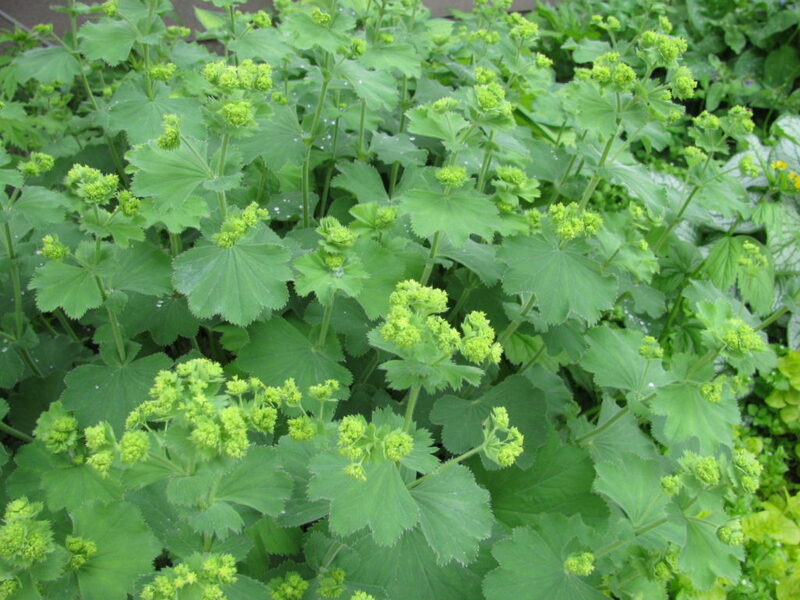 Lady’s Mantle – I love the way the rain sits in the leaves after a spring shower. The leaves are cup shaped and it looks beautiful when they hold rain drops. This perennial is easy to grow and takes no maintenance at all, except if you wanted to divide it. You could do this after 3 or 4 years and get two large plants instead of one. 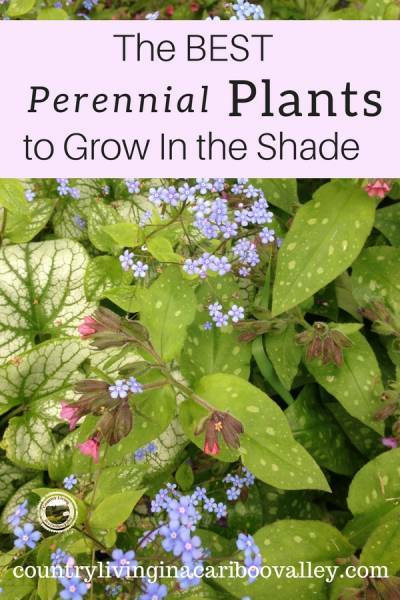 Getting more plants is such a bonus with using perennials. Use them for starting new flower beds! 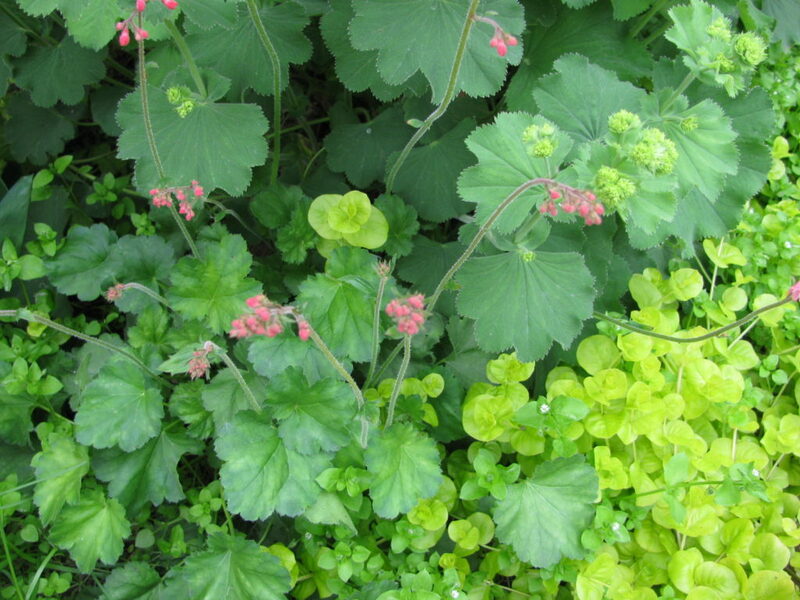 Coral Bells – I have a couple of these plants and eventually hope to divide them and get more. This plant is slower growing than either of the above, but again needs no maintenance. Very pretty little flowers sit way above the leaves. In the picture above, you can’t even really see the foliage, just the dainty flowers rising up. 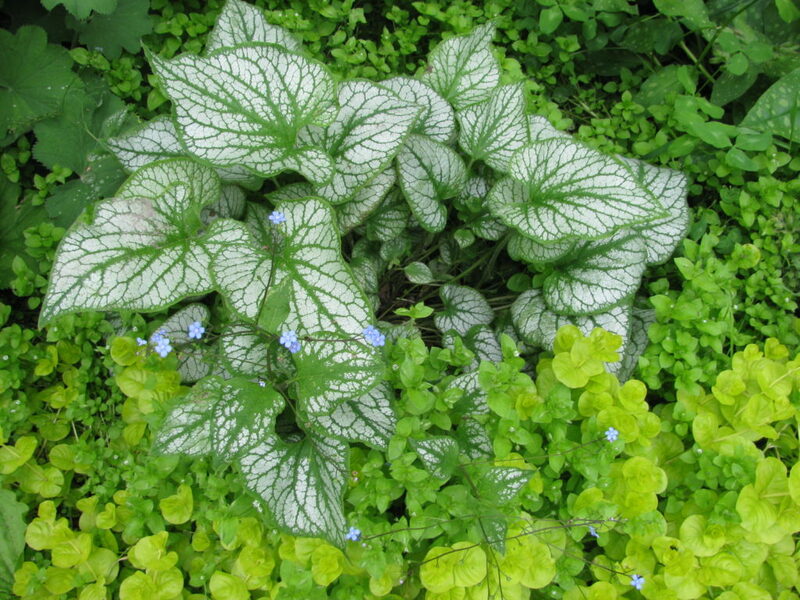 Brunnera – I started out with 3 of these plants and now only have 1. I planted perennials that could stand a Zone 3 climate, with temperatures down to -35C in the dead of winter. That doesn’t mean they are guaranteed to survive! Lungwort – I used to grow this on the West Coast. I was surprised that it would survive up here in the Cariboo. Pretty little flowers with colours ranging from pink to blue on each stem. Love this! 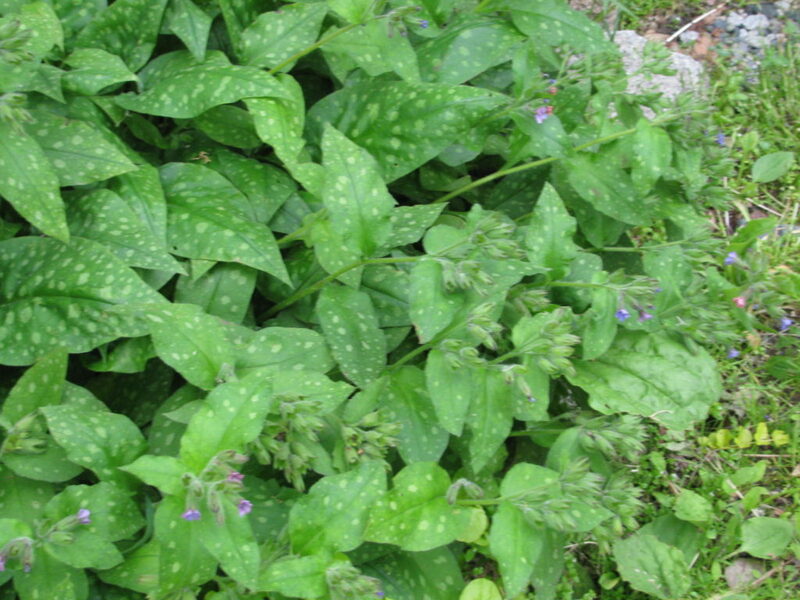 Lungwort is another plant that needs virtually no maintenance. It will spread over time so give it a bit of room. I am very happy with my flower bed for the shade – I would eventually like to add some height to this corner with a metal sculpture. I could just store it in the workshop over wintertime. This shady portion of our yard is where you will find us around 3 or 4pm each Summer afternoon. One day, I hope to have an actual seating area here. If you have an area of your yard that doesn’t get any sun, why not make a flower bed for the shade there? Add some patio pavers or even just some comfortable chairs. You will have a cool (and pretty) place to rest awhile in the summer heat. Is this the year you will be planting fruit trees? Here’s how we planted fruit trees – now we enjoy picking apples every Fall. Got weed problems? 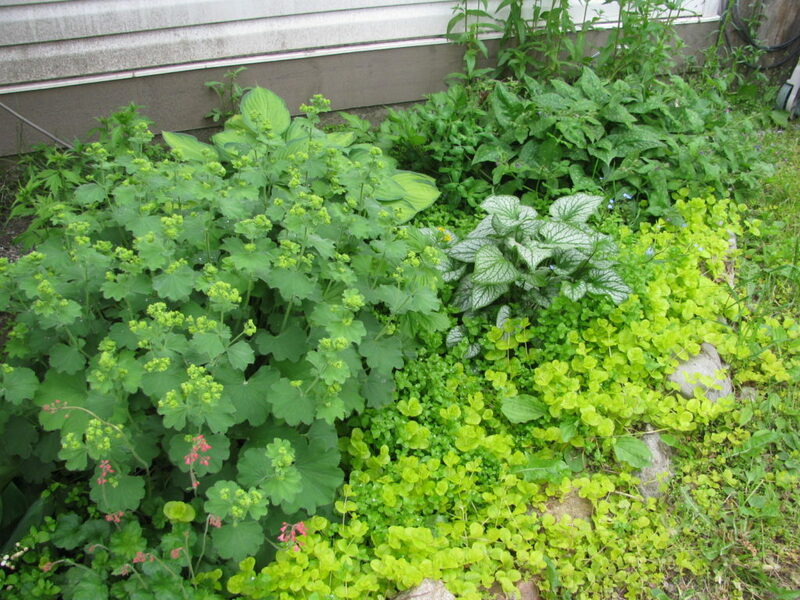 Here’s a Homemade Poison Ivy and Weed Killer Recipe – it really works.